November 11, 2013 -- This past Saturday morning, members of the Glen Head-Glenwood Business Association gathered at the Glen Head Community Center to repair and replace bulbs on 50 snowflakes that will be hung from lamp-posts throughout the Glen Head-Glenwood business district this holiday season. 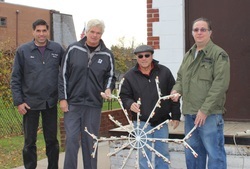 The group hopes to have the ornaments brightening darkened skies and spreading holiday cheer by Thanksgiving. The seasonal repair work and lighting of the snowflakes has now been a tradition for more than 30 years. All funding for the displays is provided through donations, and work is done exclusively by volunteers. Lending a hand on Saturday were Michael Grieco of Glen Head Motors, Christopher Hole of #1 Electrician, Bill Manfredonia and Angelo Stanco of A+ Art Signs and Graphics, Sheila Wenger of Daniel Gale/Sotheby’s Sea Cliff office, Cathy Elorriaga of Northwordnews, and Tucker Tongue of Brookwood Contracting. The Glen Head/Glenwood Business Association seeks to enhance the health and profitability of local business by helping to promote, develop, and protect the overall business interest of the area and its economic region. In addition, the group “strives to actively promote the civic interests, the general welfare and prosperity of the Greater Glen Head/Glenwood Area.” In the furtherance of these goals residents and local proprietors are encouraged to shop and eat local. Through its monthy meetings the Association provides opportunities for local businessmen and women to network and attend educational workshops and presentations. At its November 20th meeting, Robert Gibson of the First National Bank of Long Island will present the topic, "Investing for the Long Term." The group is not limited to Glen Head and Glenwood, but includes and welcomes business people from Sea Cliff and other surrounding areas. The Association meets the third Wednesday of each month at 6 pm at the Glenwood American Legion Post on Glen Head Road. On December 11th, the group is holding its annual Christmas party, and all local businessmen and women as well as residents are invited to attend.